“The idea of the Melanesian Farmer First Network (MFFN) is to develop a network that can expand the successful experience of the Kastom Gaden Association in the Solomon Islands to a regional level”, said MFFN coordinator and TerraCircle adviser and Melanesia specialist, Tony Jansen. “Food security and sustainable livelihood development at the village level are increasingly important issues in the Melanesian countries of Papua New Guinea, Solomons Islands, Vanuatu and Fiji. “The development of these things, based around village agriculture and natural resource management, are critical to addressing population growth in the region. A high degree of self reliance at the family, clan, community and local level is an important security net and a key ingredient for a reasonable quality of life for the majority of Melanesia’s people, according to Tony. MFFN assists participating NGOs through group training, the exchange of skills and improved communications. This will make possible the scaling-up and dispersion of the organisation’s experience through the region so that the experience of any one organization can benefit others. “Constraints to working in Melanesia include poor communication, limited access to funds, lack of transport and civil unrest,” said Tony. “The problem in a culture spanning numerous islands and based on small, isolated villages in sometimes difficult terrain is making knowledge of successful approaches to development more widely known. “News of successful approaches to development must be spread through the region. If people can learn about what has worked elsewhere they can copy and adapt it to their own circumstances. To do this, better communication is necessary. That is why the Farmers First Network focuses on the sharing of information and the means to share it. “We are the linking the Network’s participating organisations through an email system based on high-frequency radio. Using economical communications technology and expertise available through the TerraCircle consultancy, the email system facilitates the sharing of information and planning. It is an enabling technlogy”. “The beneficiaries of the Network are rural people who are involved in the activities of the member organizations of MFFN”, said Tony. “This includes a great many women because it is women who do most of the farming work in Melanesia and who have primary responsibility for family health”. “The organisations include the Kastom Gaden Association (KGA) and Planting Material Network in the Solomon Islands, the Paruparu Education Development Centre (PEDC) and Bougainville Food Security Network, both on Bougainville in PNG, Community Based Health Care (CBHC) in PNG’s Southern Highlands Province and, with some additional support, the Farm Support Association (FSA) in Vanuatu. “Other organisations may join initially as observers and receive technical training and skills from MFFN members. This will assist them to develop the capability needed to become full members”. In the first year of operation the network established a management committee, started an exchange program to build a Melanesian-to-Melanesian capacity building process, developed a plan to deploy an email communication network for MFFN partners and made a start on networking donors and groups in the region. “This is beginning to show results but needs more effort and lobbying,” said Tony. “It is this involvement of organizations in the different countries of Melanesia that make Farmers First an example of what development professionals call ‘south-to-south’ aid,” said Tony. “It means that people and their organizations in developing countries help each other. It recognises that relevant skills and knowledge already exists in developing countries and that they can provide mutual assistance. “The involvement of TerraCircle improves the regional credentials of Farmers First and links the region’s major developed nation, Australia, with its developing neighbours. There are links at the government and business level, but this builds a partnership at the grass-roots level, in what is called ‘civil society’. “Helping to increase the ability of poorly-resourced Melanesian organizations is a way that supporters in Australia can assist in the development of regional self-help through south-to-south aid”. The past decade has been one of prolonged civil unrest in PNG’s Southern Highlands Province, of war in Bougainville (North Solomons Province, PNG) and ethnic confict in the Solomons. “Conflict and tension in the Solomon Islands led to near or total collapse of government services for food security and community health”, said Tony. The potentially disruptive impact of civil unrest must not be underestimated, said Tony, however organizations participating in MFFN such as CBHC, PEDC and KGA have demonstrated an ability to operate amid conflict and unrest. “This is one of their key strengths”, explained Tony, who remained in the Solomons for the duration of the unrest, coup and conflict that started in 1998. “The ability to operate in uncertain situations comes through effective and decentralised organizations, committed individuals and locally developed and supported programmes. “Nonetheless, a serious escalation in unrest would impact on the program and activities may need to be scaled back or redirected for a period of time”. The region’s poor communications slowed activities in the Network’s first year of operation. “We are improving communications by deploying the email-based, high-frequency (HF) radio-linked network, although there remains the risk that technical problems could lead to further communication problems”, Tony said. “Building on our Melanesian-to-Melanesian approach, the People First Networks (PFNet) in the Solomon Islands provides assistance in the form of training and support. PFNet is a local organization that has developed the transmission of email communication over the HF radio network. There are now something like 10 email stations in a number of Solomon Islands provinces and in December 2003 the email station at Tari in the Southern Highlands of PNG came online. That is operated by MFFN partner, Community Based Health Care”. MFFN partners are provided with a limited amount of direct funding. The MFFN management committee provides management guidelines and reporting requirements before funds are released. The December 2003 MFFN annual meeting in Honiara discussed financial management and the introduction of common accounting methods. “Specific training and agreed minimum standards in financial management will be provided to partners”, said Tony. “All the partners have various level of experience in managing and acquitting funds. Periodic monitoring visits will detect problems and improve capacity in this area”. The MFFN management committee, composed of one senior representative from each partner organization, will monitor the programme to maintain accountability to the partners who are the primary beneficiaries. The committee will visit partner organization field activities to carry out on-the-ground monitoring, where possible. The effectiveness of the network will depend on the sourcing of donor support for a long-term programme of capacity building. “Although reliance on external funding is not self-sustainable over the long-term it is likely to be more cost effective than the current top down-programmes. The capacity of government to implement this type of programme is severely constrained by continuing civil unrest”, said Tony. “For many of the beneficiaries, the partner organizations are their only means of support in the area of food security, community health and livelihood development. For this reason the network, as a capacity building process, is critical for the sustainability of local organizations”. “The first year demonstrated the fact that a regional network assisting grass-roots organizations focusing on food security and community health can deliver benefits”, said Tony. “The partners have shared expertise in seed production and community seed networks, livestock training and support services. In the near future there will be sharing of information about small business and the training of trainers. “Because of its objective of expanding organisational capacity and to replicate the experiences of successful community NGOs in food security and community health, this must be a long term program of five to 10 years. In this respect, the Network is following international trends in sustainable agriculture that seek to scale-up the successful experiences of local organisations and introduce the approaches into the mainstream. “In the third year the program will continue with support for core strategic activities of each partner, partner training and exchanges”. 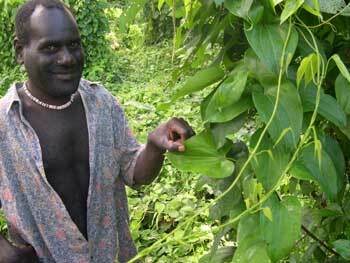 TerraCircle consultant, Tony Jansen, is coordinator of the Melanesian Farmer First Network.